Spineous problems or complaints at the limbs can occur when joints don’t move properly. This can be named a ‘restriction’ or a ‘blockade’. During the treatment, the jointcapsule will be stretched to restore the normal range of motion. This treatment is completely safe not painful. When muscles are tight we can apply massage. Effects are increased bloodflow, decreased musclespasms and decreased swelling. There is also a special technique to treat scar tissue. We always combine massage with other treatment techniques to get maximum effects. This effective, drug free method is often confused with classical acupuncture, because we use the same tiny needles to put in the muscles. The concept of dry needling is based on anatomical and neurophysiological principles and aims to relieve pain and stiffness caused by triggerpoints (extra tensed muscle cells). Sometimes the treatment can be uncomfortable for the horse. That is why we don’t use this type of treatment for hypersensitive horses. This is not a standard treatment, but can be used additionally with permission of your veterinarian. Thermotherapy – Indications: reduce swelling, inflammation and pain. Most people have seen this taping method, also known as ‘Elastic taping’ or ‘Kinesiotaping’, being used in human sports. In this concept an elastic tape is applied to stimulate the skin and by this relief pain, reduce edema and improve muscle function. It can be used for hours or for weeks. 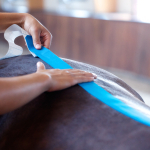 We only use high quality taping material by VetKin, that was designed exclusively for veterinary use. It doesn’t matter which colour you prefer, wether it’s black, blue, orange or red, the elasticity is the same. It is important to not only to restore motion, but also improve coordination, strength, stability, endurance and speed. The only way to achieve this is by (recovery)training. We often show the riders or the grooms some exercises to do with the horses to support the treatment. If it’s required, we can advice about management issues like saddlefitting and posture of the rider.